St. Patrick's Day had its beginning as a religious holiday meant to celebrate St. Patrick who had brought Christianity to Ireland hundreds of years ago. Throughout the years, St. Patricks day has turned into a commercial celebration promoting Irish heritage and parties throughout the United States and the United Kingdom. While the holiday is nationally recognized in the United States, it has not become an official holiday in the U.K. though there are many celebrations in both Ireland and England to mark the event. With an estimated 5.9 billion spent on the celebration and events for the St. Patrick's Day holiday it is becoming a popular shopping holiday that retailers are beginning to count on to boost their bottom line in the Spring months. How Does the Population Plan on Celebrating St. Patrick's Day? plan to wear apparel to commemorate for the day. What Age Groups Spend the Most on St. Patrick's Day? While the younger age categories spend the most on celebrating the St. Patrick's Day holiday everyone seems to participate in spending patterns whether it is on an evening out, to host a party, or just to buy some decorations or clothing. To get into the season, many people are buying to celebrate. 18 to 24-years-olds will spend an average of $39 on this St. Patrick's Day purchases. $42 is the average that 25 to 34-year-olds will spend, making them the category with the highest average spending. 35 to 44-year-olds will spend an average $40. In the category of 45 to 54-year-olds, the average spending stays consistent with $38. The first major drop comes in the age category of 55 to 64-year-olds who will spend an average of $33. The age category with the lowest per average spending is the 65 plus age group with $28. Where do St. Patrick's Day Shoppers Typically Make Their Purchases? Whether they are buying party supplies, looking to pick up some green to wear to work or on a night out, or looking to decorate their home, consumers will shop at a number of places this year to prepare for the St. Patrick's Day festivities. 38% of buyers will make purchases at a grocery store. 31% will shop the deals at a discount store. Department stores will see 20% of the consumers shopping for St. Patrick's Day. 19% of consumers will spend money at a bar or restaurant. 9% of shoppers will spend money at a specialty store, online, or at a local business. 7% of buyers will spend money at a drugstore. 4% will make a purchase at a specialty clothing store. 1% of consumers will buy something from a catalog. Women are more likely to spend money at a grocery store than men with 37% of women shopping there and 26% of men. Men are more likely to make purchases for St. Patrick's Day at a specialty store than women with 23% of men shopping there and 16% of women. What do Consumers Purchase for St. Patrick's Day? 50% of buyers will spend money on food choices for St. Patrick's Day celebrations. 41% of consumers will spend money on beverages. 31% of shoppers will purchase apparel items to wear for the holiday. Decorations will be bought by 26% of consumers who spend money on St. Patrick's Day. 16% of consumers will spend money on candy purchases. 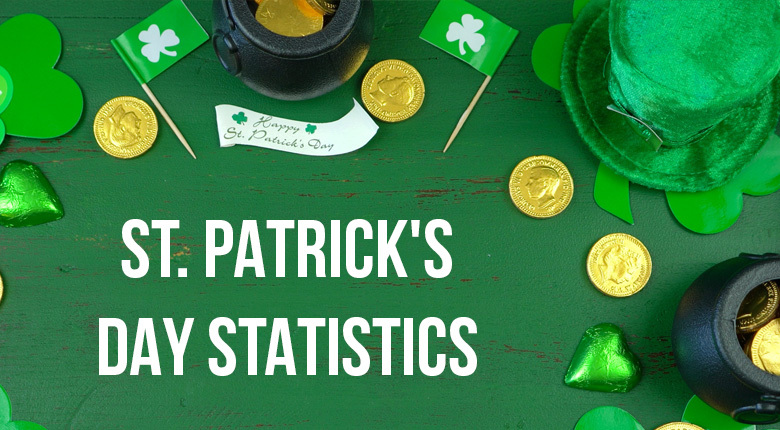 Now that we have covered the origins of this shopping holiday as well as some of the shopping statistics that surround it, check out these additional fun facts you may or may not have known about the St. Patrick's holiday. The first St. Patrick's Day event was celebrated in March of 1792. Over 149 million people plan on celebrating the holiday in some way. 83% of all celebrators plan to wear green. The Chicago River will be dyed green for five hours to commemorate the event. Consumers will spend an average of $37 in preparation for celebrating the holiday. The color green and the number 7 are often used to attract online shoppers to St. Patrick's Day sale items. Until the 1970's, St. Patrick's day was considered a religious holiday in Ireland with drinking being prohibited. 23% of those participating in the holiday plan to decorate their home with the most popular decorations being leprechauns and pots of gold. 20% of all celebrators are planning on attending a private party or event. 82% of consumers plan to wear green in celebration of the holiday. 18 to 24-year-olds are most likely to celebrate with 73% participating, and 65 and up are the least likely to participate at 35%. With over one-half of all consumers planning on celebrating the St. Patrick's Day holiday and spending almost $6 billion in sales, the March holiday is a lucrative time for many bars, restaurants, and other retail stores. Younger age categories not only are more likely to celebrate the holiday event but also will spend more on average whether it be on the evening events or on apparel to show their celebratory spirit. While only about 9% of shoppers plan to shop for the St. Patrick's holiday online with a continued increase in online marketing and the ability of internet shops to connect buyers with unique and specialty items there will most likely be an increase in online shopping for the upcoming St. Patrick's Day events.